This year marks the 25th Anniversary of the We the People National Finals. We would like to honor the academic achievements of students, teachers and the communities that support them. Fifty-six classes and communities from throughout the United States have raised nearly $2,000,000 to ensure the success of the National Finals. The 25th Anniversary We the People National Finals is partially funded by Center for Civic Education and the "Fund for Freedom and Democracy." This donation is made in the honor of the Honorable Patricio M. Serna, Justice of the New Mexico Supreme Court. The We the People program is dedicated to promoting the ideas and principles of democracy and bringing our high school students together to demonstrate their knowledge and understanding of constitutional government. The National Finals is the culmination of the tremendous effort of teachers, students, parents, and We the People state coordinators to secure community sponsors. The Center for Civic Education extends its sincere appreciation to all class sponsors. 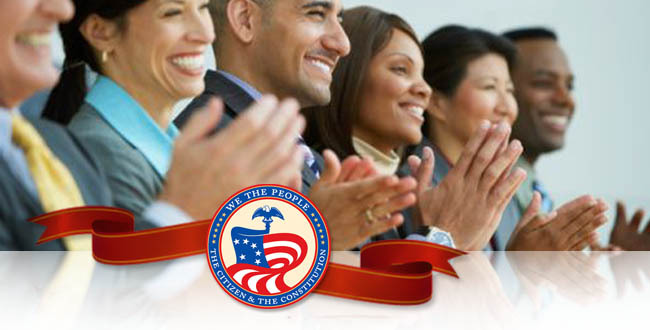 It is their sponsorship that makes the We the People National Finals possible. The Center encourages everyone with an interest in the We the People program to thank and support these generous sponsors. En Cana Oil & Gas (USA) Inc.
Jim & Marsha McNally, Jr.
Nabors Giblin & Nickerson, P.A. Richard C. Mariani, Jr. P.A. Donn E Mettens Jr., D.M.D., M.A.G.D. Hampshire County Bar Association Inc.
our events and donated their invaluable time. Lake Tahoe Real Estate, Inc.
Joe Wittig; Components Co. Inc.